Have you ever had one those clear, self-aware moments when you think to yourself, "I will not have the opportunity to experience something quite like this again?" It's a sentiment that compels you feel everything in a more drawn-out, self-indulgent manner. You're paying close attention, afterall. I experienced this last Saturday, when I found myself at Memorial Pool for Solar Year's unforgettable underwater album launch. The event was sponsored by Pop Montreal, Suoni Per Il Popolo and complexgeometrics. It began at 7:00 p.m. Solar Year is comprised of two individuals, Ben Borden and David Ertel, who wanted to hold their album launch in a unique space that also complemented their style of music. "At first, we thought about throwing a kind of suburban pool party in a house somewhere. But then, Aleks Schürmer, who helped produce the event, proposed using underwater speakers, which Ben and I loved," said David. 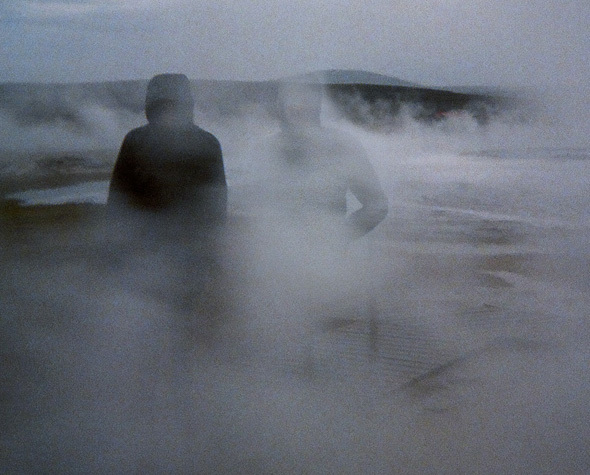 "For us, our music often conveys a sense of floating and transcendence, and so this underwater environment seemed to really fit with that feeling." David sings, while Ben focuses more on percussive elements. They both participate in the computer sound manipulation. "Auto-tune is an inspiring tool, said David. "There are all kinds of unexpected ways to use it and it ends up generating a lot of the sounds we use." After the sweet fellow at the entrance drew a sun on my hand in blue marker, I swiftly changed into my bathing suit and ambled my way to the pool. Never being the type to hesitate or ease myself into a situation, I consciously snubbed the steps. As I approached the edge, my bare flat feet slapped against the wet floor -music in itself! I then pulled the air around me inside, making it mine with an undignified open maw. My entry was a thing that could be described as half-step, half-jump and fully awkward. Maybe someone thought it was a sight to behold, I don't know. Finally below the surface, I lifted my arms and let myself drop deeper into the water. I closed my eyes because I heard somewhere from someone sounding profound that this is a way to perfectly focus a certain sense, sound for example. This is likely untrue, but I did it anyways. The quadraphonic underwater sound system pulsed with Solar Year's musical offerings, which were surprisingly crisp in sound. In the darkness behind my closed eyelids, the loops, reverb and layered vocals seemed to me a phantom's song. Stories told in an underwater grave. This association is perhaps, not unusual, given Solar Year's identification as a gothic, ambient and pop band. Of course, it is difficult to reduce any band to one or even a few genres. What always remains is the music, and there it was traveling through the water in dense washes, casting its dark introspective spell. David describes Solar Year's creative process as a kind of natural selection. "We often start a song by building a primordial soup full of tons of musical ideas. A lot of these sounds are based on samples of my voice or other voices. Then we start to layer these sounds and cut them up. The ideas that survive end up being organized into songs." Solar Year performed at a safe distance from the edge, singing to the audience who gathered at their feet with tilted gazes. 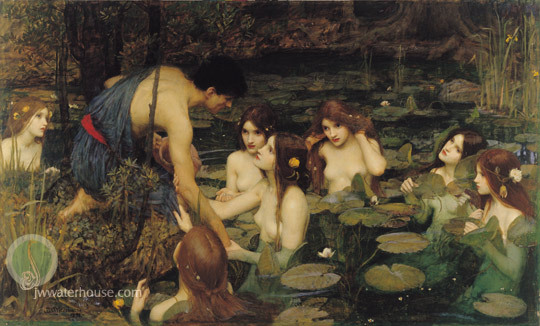 The beautiful faces around me were redolent of curious mermaids and water nymphs depicted in so many of those Waterhouse paintings. The less aquatically-inclined fans sitting high atop the surrounding bleachers would have gotten a nice aerial view of all of this. Though I must say they certainly missed out on the interesting way the water enhanced the music. If pressed for more clarity, I would claim that it added new depth and movement to the already textured sound. It made my heart feel big. But, this does not encapsulate the subjective conscious experience, which is difficult to describe here. I imagine it was an equally ineffable moment for many. An experience of qualia, perhaps. Solar Year's new ten-song offering is called Waverly. If that name rings a bell, it may be because it was inspired by the beloved local street. "A big part of the album was created on this street, which is where our homes and studios have been since we started making music together," said David. Next year, Solar Year will be performing their sound installation at a pool in Vancouver as part of a media arts festival. As for the more immediate future, Solar Year will be helping John Londono, along with duo Emily Bock and Evan Prosofsky with some very exciting videos. They're also making the soundtrack for a fancy spa in the Old Port. What more to say? This was a singular event conceived by a very promising local act. You can visit Solar Year's official webpage here. The only way to get anywhere close to a fair estatmie is to actually call up a solar installer in your area, and get a free quote. The price depends vastly on your energy usage, and your location. Two houses can be neighbors, and one can use 20 times as much electricity.Solar hot water costs $4-6k, after which you may get some rebates or credits.Solar electricity costs $6k and up, after which you may get rebates or credits. A typical system, if there is such a thing, is several times that size, and it is not unheard of to have a system 20 times that large.